Hayakuri Gin in Ittezon Kakukawari ; part 1. 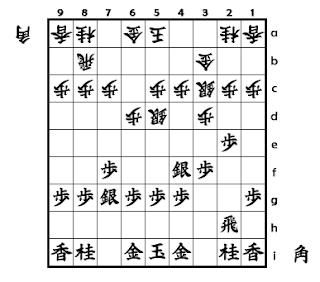 In the diagram 1 , Sente has made "Hayakuri Gin" formation ; S-4f , but if he wants to start attacking with P-3e , he must move K-6h or P-1f before attacking . Why he needs such a move . 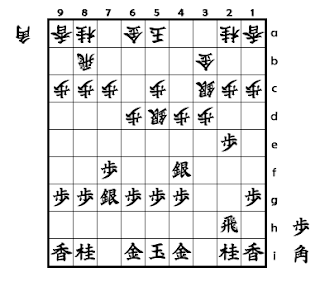 If he starts attacking 10.P-3e , the game will advance like following moves . Then Gote gets a fork on King and Rook . 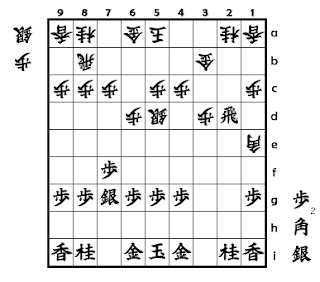 In the diagram 2 , Sente has a lost position . This is because , Sente must move K-6h or P-1f . By these moves , Sente can avoid this line . In addition to shown above , Sente can avoid this fork on King and Rook by 12.S-4f . But we think this line isn't good . Because Sente has started attacking once , but he gets no effective result but one Pawn in hand . And Gote will get better position with "Koshikakegin" formation . Sente can't attack any more .